You're going to want to try this. It's a no-brainer. 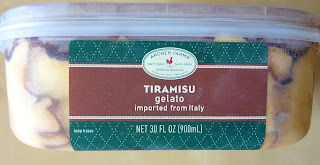 I was skeptical at first, but this is tied for the best-tasting tiramisu I've ever had. And it's not even really tiramisu. It's gelato. The first time I ever had tiramisu was in Los Angeles, about eight years ago. I was with a couple of friends, and one of them brought along this crazy French photographer guy I had never met before. He discovered that one other person in our group and I had both never tried real tiramisu, so he took us to this expensive Italian restaurant on Melrose. I insisted that I didn't want any, but he bought all of us dishes of the dessert anyway. It was like $10 for three small bites. It was ridiculous. But so good, it was almost worth the price tag. Since then, I've tried it at a couple of less-swanky restaurants, and it has been sub-par every time. Until now. As I mentioned before, the flavor of this gelato is excellent. The top layer tastes like the most rich coffee...it's almost chocolatey. And the ice cream itself is buttery, creamy, sweet and vanilla-ish. Delicious. There are a few swirls of the dark coffee goodness throughout the gelato, too. It's mixed-in at a pretty good ratio. 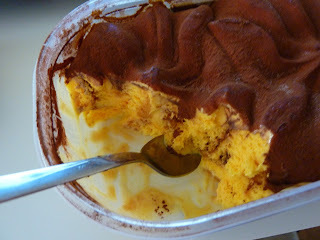 There's a lot more of the plain golden ice cream, but the dark stuff is so rich, you don't need a lot of it. The one weakness of this amazing dessert is a slight lack of texture. The creaminess of the ice cream is great, and the softness of the top layer is good...but real tiramisu is made with cookies. Ladyfingers. If they had added ladyfinger cookies, or even just cookie bits soaked in coffee throughout the ice cream, they could have created the ultimate dessert. 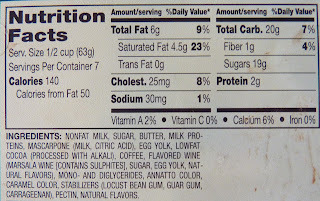 Also, there's carrageenan in it, which is bad for you. 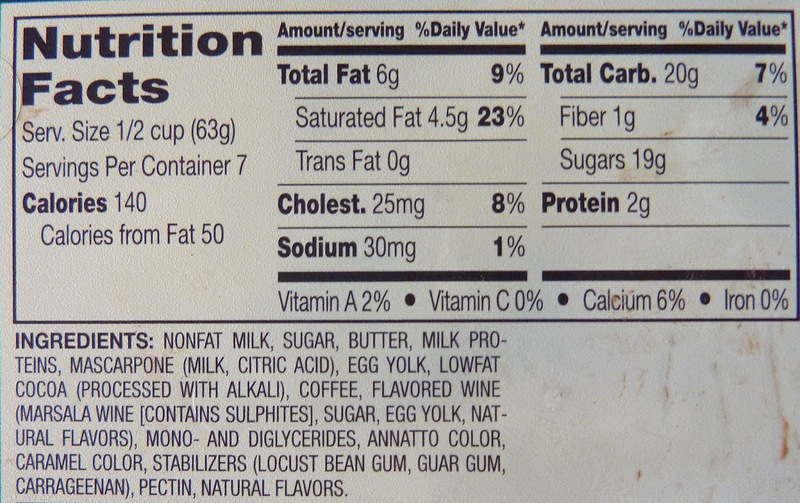 But it's so low on the ingredients list that we all could have overlooked that. But seriously, if version 2.0 has little ladyfinger cookie bits all through it, you can bet I'll have heaps of this stuff stocked in my freezer all the time. Even as it stands, this is one killer gelato. I give the tiramisu gelato 9 out of 10 stars.